Wanna learn something new? If you’re a veteran of this harness-free rock climbing sport, or even if you just want to try your hand at it, Hampi is the place to go. Bouldering is basically rock climbing done without any ropes, harnesses or equipment. With its giant boulders that are split apart vertically, these rocks create ideal problems to climb. By the way, ‘problem’ here is used as a good thing – it is the equivalent of a challenge (hey, we’re brushing you up on bouldering lingo too!). 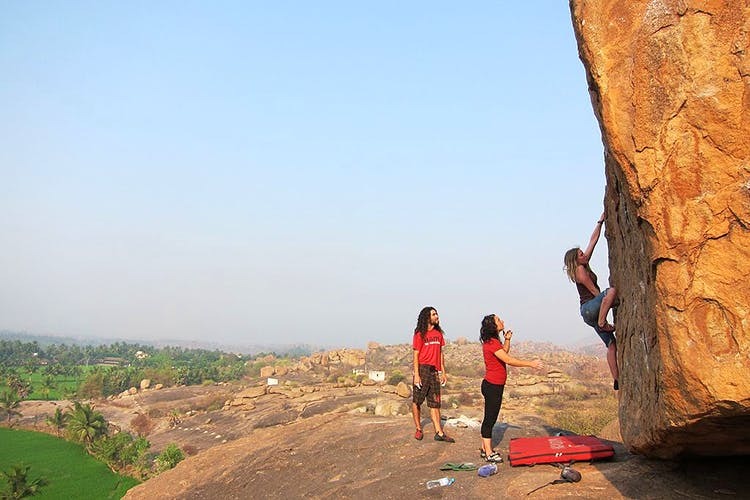 Try boulder climbing at one of the world’s best bouldering locations – Namma Hampi! The boulder area is on the other side of Hampi, and there are boats that you can take to get there. The ideal place to stay would be The Goan Corner since it’s closer to the boulder area and they also hire crash pads that you can take for your climb. You can also ask for two local climbers, Jerry and Tom’s shop where you can buy or hire any other basic equipment you may need. We suggest you go during November, December or January as this is climbing season owing to them being the coolest time of year and you won’t get caught in any rain while being halfway up a boulder! The main climbing area is Hanumanahalli near the Sri Laxmi Golden Beach Resort and that’s where all the boulders are. Each boulder even has a name (probably christened by bouldering tourists)}! Just for fun, we’re going to tell you a few of the names – Banana Baba, Egg Boulders, Hot Slapper and Sunset View. If you climb on top of the Sunset View boulder, you’re guaranteed to witness a show-stopping sunset every evening. Apprehensive to go try it out alone? Fret not! If you go during peak season, there are plenty of veteran climbers from all over the world who’ll be more than happy to help you out. Plus, there are many free guides available online where you can find exact map coordinates for each and every boulder. And we’re telling you now, so you have enough time to practice at any of the climbing stations in town. Rock on!